Connecting your taste buds with your earbuds. We are ecstatic to announce our featured artist of December 2017. Ariel Petrie is one of our favorite Nashville pop artists around and she's just released some new music we're happy to share with all of you. Ariel Petrie grew up listening to many different styles of music. Artists such as Copeland, mewithoutYou, Ingrid Michaelson, and various other indie artists inspired her to write more thought provoking lyrics. However, she still drew influence from catchy, upbeat pop artists such as Katy Perry, Sara Bareilles, Coldplay, OneRepublic, and Maroon 5. 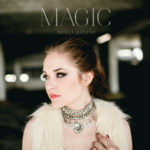 To merge these 2 seemingly opposing influences, Ariel has combined the whimsical wonderment from the pop realm with the poetic ponderment from lyrical indie scene to create a truly captivating sound within the pop genre. Check out Ariel Petrie on our Indie-Pop playlist and her Spotify channel. Also, make sure you pick up her new EP "Wanderer" on her website! Stay informed on our newest beans, tutorial videos, and anything Tasting Notes related.